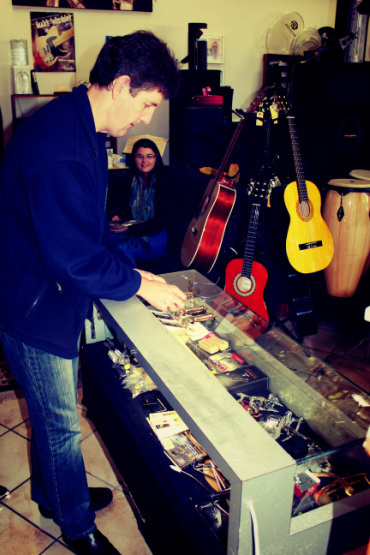 The Gear Junkie is not just a shop selling music equipment, it is a central place for people to get together, chat, trade, learn and relax in a safe environment. We are really passionate about 'old stuff' and do not want any gear, no matter how good or bad it is, to end up in the bin! This can sometimes cause an environmental problem, especially with electronic pc boards etc. Do not just throw them in the bin, bring them to us and we will do our magic and turn it into something new and also give someone the opportunity to make an income. The Gear Junkie is also dedicated to providing you, the customer, the best deals on quality 'Pre-Loved' music equipment. The Gear Junkie can also source any new equipment at the best possible prices. We will strive to beat any written quote that is current, and give you the best service and coffee! The Gear Junkie will offer a fair, market related price on any gear you want to sell.. If our offer is not to your expectations, we can sell it on your behalf on a consignment basis in store and on-line. We also consider broken instruments, no instrument deserves to die. Let us make you an offer and re-cycle it into something new. PLEASE BRING IT IN, OR DROP US AN EMAIL WITH PICTURES for us to evaluate. I have always had a great passion for musical equipment, especially old, rare and quirky gear. It is the stuff one does not see everyday that really gives me goose bumps. I have bought, sold, traded and collected gear for the last 25 years. I have been lucky enough to work in the musical retail and wholesale industry for 10 years, with a small 2 year break where I had a small production studio operating at the back of a musical instrument shop in JHB. Before I came to my senses and 'got a day job' I gigged on the pro circuit in Johannesburg and around South Africa, Botswana, Swaziland, Namibia for 10 years with numerous cover and original bands. I also did the one-man pub gigs for a few years. I have a background in electronics with a few certificates somewhere... Needless to say this comes in handy when identifying problems with gear and sorting it out for customers quickly and cheaply. The many paths I have chosen in life have led me to this - A shop where I can meet fantastic people who share my passion and provide them with great service and some great deals on Pre-Loved gear.